1. Remove the rear wheel from the frame and the quick release from the wheel. 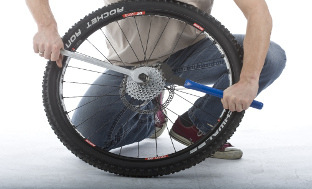 Fit the cassette tool into the axle and wrap the chain whip around the largest or second largest sprocket ring. The chain whip needs be mounted in the direct that will prevent the freehub from turning anti clockwise while removing the cassette. 2. Using a suitable spanner on the cassette tool undo the lockring whilst at the same time holding against the chain whip. You can now slide the cassette off the free hub. 3. To reattach the cassette you don’t need to use the chain whip. 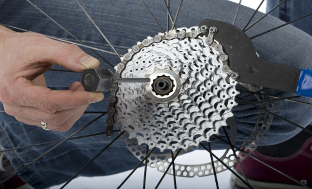 Apply a light film of grease to the freehub and slide the cassette back on in the correct order. Check that all the spacers are positioned correctly. Now screw the lockring onto the thread of the freehub being careful not cross thread either part. Tighten the lockring using the cassette tool and a torque wrench to the specified 40 Nm. V této kategorii najdete servisní úkony, které jsou určeny pro velmi zkušené mechaniky. Měl byste mít bohaté zkušenosti a technické dovednosti a také praxi v servisování závodních kol. Pro tyto úkony jsou zapotřebí speciální nástroje, které nenajdete ve standardní sadě nářadí. Ensure that all screws and bolts are tightened to the correct torque. The correct torque is indicated on the component itself, in the bike manual provided with your new bike, or here in the Technical Support Center. Canyon důsledně kontroluje kvalitu informací uvedených v tomto Centru technické podpory. Jakékoliv opravy nebo úpravy na kole jsou na vaši zodpovědnost. Nevíte-li jak něco opravit zašlete kolo do Canyonu nebo jej svěřte odbornému servisu. Canyon neposkytuje záruku a ani nepřebírá žádnou zodpovědnost za informace obsažené v tomto Centru technické podpory.